It’s been almost eight years since the launch of Bitcoin and during this period, it has been through vigorous ups and downs. Not long ago, people were skeptical about the use of Bitcoin but today, the table is apparently turned upside down. Bitcoin now forms a gigantic network of users which includes more than 100 million active users. The daily average transactions in Bitcoins also rose substantially from 100,000 to over 200,000 by the end of last year. Also, the price value of Bitcoin is breaking all the barriers and the current market cap of Bitcoin (at the time of writing) is 20.63 billion USD which is even greater than that of Twitter and LinkedIn. But despite of all these startling factors and astonishing features that Bitcoin offers, there are also some major setbacks that are slowly coming into picture. 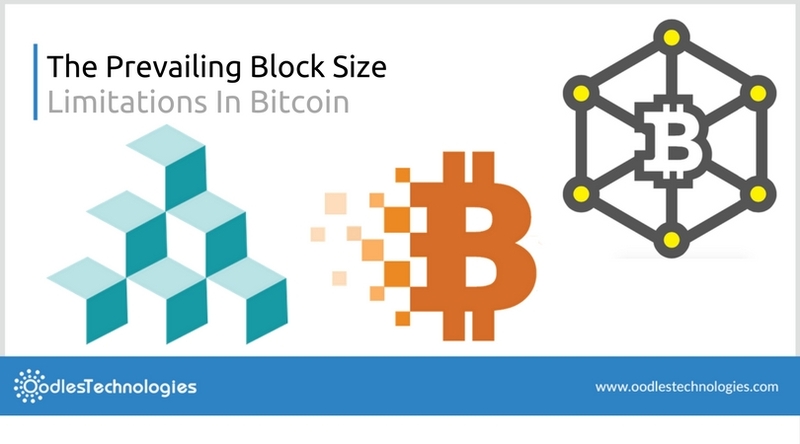 The scaling problem due to Block Size limitation is one such serious affair that has always been a matter of concern for all the all the Bitcoin enthusiasts. It has given birth to numerous debates and yet no concrete solution has been found till date. You may also like Blockchain Disrupting Every Single Sector. As we all know, Bitcoin runs on a cryptographically secure ledger called Blockchain. At its core, Blockchain is comprised of a series of individual blocks that are cryptographically chained. Each block in the ledger has a size limit of 1MB specified by the so called inventor of Bitcoin, Satoshi Nakamoto. This is precisely what the Block Size limitation is all about. Each block in the blockchain network is used to store transactions made by the users as well as the other sensitive information. So a block can store multiple transactions but this must be within the specified size limit of 1MB. Whenever a block is completed, it is added to the blockchain as a permanent record. As a matter of fact, this 1MB block size limit was imposed by Satoshi Nakamoto back in 2009-10 to prevent the blockchain from the potential DoS attacks by the hackers who might try to freeze the network by creating blocks of uneven or massive size. But as long as the size limit is as low as 1MB, all the blocks exceeding this size will be automatically rejected by the network and they won’t be added to the Blockchain. This implementation was a indeed a crucial security measure and you can’t blame Nakamoto for the existing state of the Bitcoin network. However, a lot has been changed in the last couple of years and Satoshi Nakamoto certainly hadn’t even in his dreams imagined that Bitcoin will go this big. Yes, it wasn’t really built to accommodate such a massive user base. At the time of its launch, there were only a few hundreds of the users who showed some interest in Bitcoin while today, the number has rose to as high as 10 million daily active users. So you can imagine how intense the load on the network currently is. So obviously, there are hundreds of transactions happening every minute which definitely intensifies the load on the network. But despite of all this, Bitcoin is still working fine on regular days. However, the problems arise during the peak hours when sometimes the load on the network reaches its pinnacle. You might have to wait for several hours or even days to get your transaction processed. This has also increased the transaction fee of Bitcoin upto great extent. This only seems cumbersome and irrelevant as the Bitcoin is known for its extremely low transaction fee. However, in order to get your transaction approved by the miners, you might have to offer a high transaction fee or otherwise, chances are your transaction will be delayed. While the previous transaction fees used to be in the fraction of a few cents, today you might have to pay several cents or even a dollar for a single transaction. Also read New Bitcoin Wallets Lining Up In Support of SegWit. As a matter of fact, many solutions have been proposed to resolve the scaling issues in Bitcoin but none has been implemented. The first attempt was made in 2015 when two BIPs (Bitcoin Improvement Proposals) were introduced by the Bitcoin Core developers Jeff Garzik and Gavin Andresen. These two proposals were BIP 100 and BIP 101 and both suggested an increase in the existing block size. Both BIP 100 and BIP 101 were the hard fork solutions which means if they are implemented, the older versions won’t be compatible with the new changes in the network. Out of these two, BIP 101 suggested a block size increase from 1MB to 8MB while the other one was about making the block size flexible based on the joint decision of the miners. Following these two proposals, there were countless debates all over the bitcoin community and yet we didn’t get any solid outcome. Soon after, the concept of Bitcoin Unlimited or BU was brought to light. BU suggested that there shouldn’t be any block size limit at all. Instead, it suggested that miners should have the rights to create blocks of flexible sizes and add them to the network. Another solution that has been in news recently is SegWit or Segregated Witness. But as a matter of fact, SegWit has less to do with the current block size limit. In fact, it aims on fixing the issues pertaining to the transaction malleability. The idea is to move the unnecessary data out of each and every transaction so that more number of transactions can be stored in a block with the specified size limit of 1MB. But the latter is yet to attain approval from much of the Bitcoin community and that’s why it still isn’t implemented.